SPARQL UPDATE performance gain. An easy win with the right data structure. For example, you can observe this using the following SPARQL UPDATE request against a data set with 100k or more instances of rdf:label. Looking into the timing, we found that the time to insert or remove each statement was growing in proportion to the number of statements already added or removed in the connection. The actual timings are below. In the first log output, it took 3 seconds to process 10,000 statements. The performance is fairly flat for the next 20,000 statements. However, the latency of the operation then starts to grow very rapidly. By the last log output it was taking 97 seconds to process 10,000 statements! What’s going on here!?! The underlying BigdataSailConnection batches everything into a StatementBuffer object. The StatementBuffer is then incrementally flushed onto the backing indices every 10,000 statements (by default – See BigdataSail.Options.BUFFER_CAPACITY to change this parameter). The remove statements code path is nearly identical. Both add statements and remove statements on the BigdataSailConnection are known to scale into billions of statements added or removed in a single operation. Scaling should not be worse than log-linear since it depends on the depth of the B+Tree indices (the cost of an index probe on a B+Tree is bounded by log(p), where p is the height of the B+Tree). Looking at the scaling performance, it was immediately suggestive of a poor data structure choice. Something where the cost of the scan was proportional to the number of items scanned. // Evaluate the WHERE clause. // Evaluate the DELETE clause (evaluation of the INSERT clause is similar). // Batch up individual add or remove statement calls. List.get(index) against a LinkedList does a scan. That explains the performance degradation we were seeing. A one line change fixes this. Performance for the same SPARQL UPDATE request is now perfectly flat. The main cost was the MutableTupleQueryResult scan of the LinkedList. Blazegraph automatically and scaleably buffers the data and incrementally evicts the mutations to the write cache and from there to the disk. See https://jira.blazegraph.com/browse/BLZG-1404 for the workaround and a link to the corresponding ticket that we have raised with the openrdf project. This fix will be in our next major release, and is available in hot fix releases to customers with support subscriptions. This entry was posted in Uncategorized on August 7, 2015 by Bryan Thompson. In SPARQL, Order Matters: Faster query performance and bug fixes with a substantial refactoring of the Query Plan Generator in close collaboration with our partner, Metaphacts. Updated User’s Manual and Github Repository for Code Samples with our partner, MagInfo. Online backup for non-HA, Blueprints and Sesame embedded client fixes, and much more. Have you seen our new website? 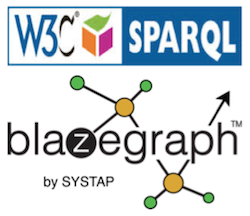 Did you know you can now purchase commercial licensing and support for Blazegraph online? Commercial Licensing is now available for online purchase. Developer Support is now available in 7 day, 90 day, 180 day, and one year subscriptions for online purchase. It includes benchmarking support! Production Support is available too! Will you be in San Jose at the SmartData or the NoSQLNow conference? We’re a Gold sponsor and will be speaking and exhibiting. Come see us and get a discounted registration. Do you have a great success story with Blazegraph? Want to find out more? Check us out below or contact us. We’d love to hear from you. This entry was posted in Blazegraph, Blazegraph Release on August 3, 2015 by Brad Bebee.